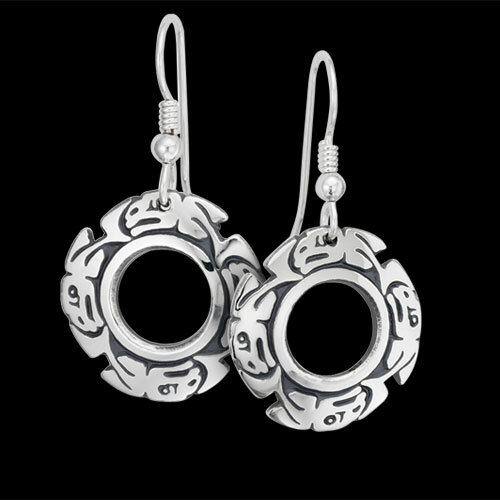 Sterling Silver Salmon Circle Earrings by Metal Arts Group. Highly respected in Native culture, Salmon are believed to be immortal animals. The belief is that after the Salmon was eaten, its spirit would find its way back to the water and rise again; creating the cycle of life and symbolizing abundance, fertility, and prosperity. My wife had lost one of the salmon style earrings. We found the original artist and they filled our order with the same product within a two week timeline. She was very pleased with the quality for about the same cost as the original purchase price. Thanks! 0.8 x 0.8 inch Sterling Silver Salmon Earrings by Frank Woll. Made in USA.